France's population is about 65 million. Assuming an autism prevalence of about 1 in 110, approximately 590,000 autistics live in France. The French education system contains about 13 million students in a two-tiered educational system: most children attend schools overseen by the Ministry of National Education, but approximately 100,000 students found to have significant disabilities -- very few of whom have autism -- attend schools run by the Ministry of Health. Most autistics are not educated at all. Significantly, childhood psychiatry in France is dominated by psychoanalysts, who (broadly speaking) view childhood behavioral issues as evidence of disturbances in the relationship between the child and the parents, particularly the mother. Psychoanalytic treatment therefore is not behavioral or educational, but seeks to change the child's emotions. According to Chantal Sicile-Kira, whose autistic son was born in France, autistic children "had no right to an education. Instead, they were enrolled in day programs on hospital sites, where they were treated with psychoanalysis. Parents had no right to visit the day program, nor did they receive any communication about what went on during the hours their child spent there." For more information on autism in France see Wrong Planet's Autism in France: Psychoanalysis, Packing, and Other Travesties: Why it Matters and New York Times' Film About Autism Treatment Strongly Criticized in France. Many of you readers who are not citizens of France may wonder why you should care about autism in France, and why I am inviting you today to help we French address the problems with autism in France. After all, foreign relations policies of unilateral interventionism and democracy promotion have failed miserably during the last decade, and the current economic crisis favors the idea that citizens of each country to think only of addressing problems within their own countries. Instead, my belief is that the “moral duty to intervene” exists. In France, Human Rights infringements for autistic people are severe and persistent enough to mandate foreign intervention in the debate. France is far behind other European countries in support of their citizens with autism, a problem that has a long history. In 2004, the trans-European autism organization Autism Europe brought France's autism policies to the attention to the Council of Europe, which condemned the French policy of educational segregation for autistic students. Successive autism plans by the French government have had little effect on improving the situation. One notable failure of each of the plans has been a complete disregard of the need for accurate information. None of the plans have included a requirement to collect any data. Thus, there is a real lack of data on autism in France, which the French government has acknowledged is a real barrier to effecting significant improvement in autism services. What we do know: In France, 80% of the children diagnosed with autism spectrum disorders (ASD) do not go to school at all, according to government data. Contrast this figure with the United States, where the Individuals with Disabilities Education Act (IDEA) requires all public schools to provide education for all students. In the United Kingdom, where school is mandatory, a study by the National Autistic Society revealed in 2006 that exclusion from school for children with autism is 1 out of 5. 1) On January 3, 2012, the French government-controlled TV channel France 2 aired a report on a family living near Paris. Their eleven year-old son Ryan had only received 72 hours of schooling in 10 years, until last year! This year, after a previous TV show and after legal threats, a special education class accepted him, but only for 90 minutes of class time per day. 2) On January 4, 2012, a middle-school teacher on French National Public Radio (France Inter) discussed an autistic child assigned to her classroom, who had a classroom aide. The teacher had received no training to support this student. The classroom aide was only in the classroom 12 hours per week with that child (of a total of about 28 classroom hours). Further, the Ministry of Education had decreed that the aide would not be allowed to work with him for more than two years as they feared a bond developing between the aide and the child! Clearly, the school system does not want children with challenging behaviors. Turning to adults, French government data on psychiatric care reveals that 60% of the persons held in isolation units in psychiatric wards for more than 30 days are diagnosed with ASD. As Danièle Langloys, President of Autisme France said during the congress of the organization on December, 3 2011: “This figure does not include the persons who are undiagnosed, so the real figure could be much higher.” This raises the question: Why must autistics be held captive and isolated from others? Institutions and psychiatric treatments are the norm in autism in France from birth to death. Compared to American children, French children are diagnosed much, much later. The lack of training for professionals, and their psychoanalytical worldview advocating “laissez faire” often result in extremely late and inaccurate diagnoses. It is commonplace to meet parents whose children were not diagnosed until the child was 6 to 10 years old. The typical waiting list for diagnosis is two years. Turning to other professions that could provide services to individual and families affected by autism, there are very few psychologists with autism-specific training. For example, in all of France, there is only one educational program that offers a master's degree in behavioral analysis. This tragedy of bad care does not end there. Now, it is time to introduce three real human rights issues: extensive discrimination, a “treatment” known as Le Packing (which could also be called “torture”), and exile to Belgium. Adults with autism face extensive discrimination. The most common is the lack of access to education and training for employment. Most adults with autism are institutionalized with low self-care skills as a result of failed educational policies. Even if they have the chance of being higher functioning (including most with Asperger’s and PDD-NOS), autistic adults are discriminated against by employers. I myself faced the issue numerous times with employers, despite my three master's degrees. Worse, persons with autism often get denied access to resources dedicated to autism! “It is outrageous that institutions created for autism treatment do not accept persons with autism. Obviously I do not single out individual cases, but generally speaking there are folks that are trying to direct children or young persons with behavioral problems toward the exit. This is unacceptable to me,” recently declared Marcel Hérault, President of Sésame Autisme. Autistics are subject to invasive care and conditions favoring sexual abuse. 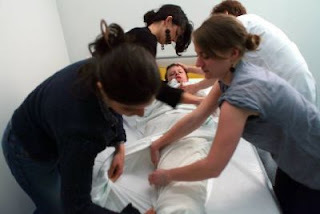 The best example of abuse in France is Le Packing, a barbaric practice which consists of wrapping autistic children, naked or stripped to their underwear, in cold wet sheets (at 50°F, 10°C), like mummies. Some teams even put the sheets in the refrigerator before using them. (Read a detailed description and critique of Le Packing at Support the Wall.) Today, in 2012, this technique is still used in 300 establishments in France. Le packing has been used on children with autism for over thirty years despite having never been subjected to any evaluation other than a few adult case studies. We have reached the consensus that practitioners and families around the world should consider this approach unethical. Furthermore, this “therapy” ignores current knowledge about autism spectrum disorders; goes against evidence-based practice parameters and treatment guidelines published in the United States, Canada, United Kingdom, Spain, Italy, Hungary, and Australia; and, in our view, poses a risk of preventing these children and adolescents from accessing their basic human rights to health and education. There has also been an active on-going campaign by of the organization Vaincre l’Autisme, Manifest International Contre le Packing (International Manifesto Against Le Packing). Nevertheless, France has refused to ban this practice. It has been eight years since the resolution against France at the Council of Europe and three years since the start of the campaign to ban Le Packing. The situation of autism care in France has yet to change. At best, the French Government is starting to feel the heat and tries to cover its tracks by declaring 2012 the year of National Attention for Autism, by creating a study group at the French Parliament and by issuing some reports. Autism organizations are weak because they accept funding from the government for awareness campaigns through a new entity, Collectif Autisme, and because they are fragmented. In reality, organizations have already been told that no additional funding will be available due to the current economic crisis. In this context, there is little hope that the humanitarian situation will change unless the international autism community becomes involved. Thanks to your support, self-advocates and parents will prove that a viable international autism community can exist, and that wherever we live basic human rights must be respected. We shall never accept being treated as second-class citizens. It is past time to promote change in autism at the international level. It is now time for the international autism community to step in and to say enough!